A WOMAN WHO pretended to be the widow of a Grenfell Tower victim so she could claim money and accommodation has been convicted of fraud. Joyce Msokeri, 47, was found guilty at Southwark Crown Court today of a number of offences connected to a scam in which she went onto claim her made-up husband had actually survived and taken refuge in a cave. 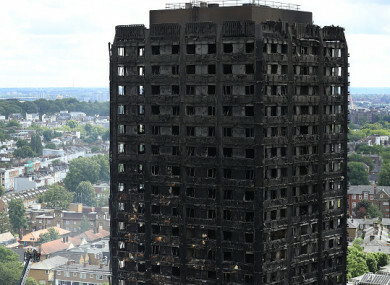 In the aftermath of the fire on 14 June last year in which 71 people died, Msokeri gave a fake name to relief workers to falsely claim food, clothing, money and a month’s accommodation in the Hilton hotel in Kensington. She also tried to get rehoused, despite living in a flat in Sutton, south London. She claimed to have moved into Grenfell Tower in February 2017 to live with her husband who she said died in the fire. As part of the fraud, Msokeri told investigators she subsequently discovered her husband had survived and had been living in a cave in Margate in Kent where he was fed by tourists. She persuaded a vulnerable man to pretend to be her husband and went to the length of admitting him into a mental health ward to support her claim, the Crown Prosecution Service (CPS) said. As her story unravelled, investigators discovered she actually lived in Sutton and there was evidence of calls to a satellite TV company the day after the fire to negotiate a new contract. The total value of her fraud was £19,000 (about €21,500). Kate Mulholland, Specialist Prosecutor with the CPS, said Msokeri “gave a variety of different stories to try to dishonestly profit from the aid meant for the real victims of this tragedy”. She tried to persuade others to give information which might back up her evolving lies but in the end she was unable to keep up all the pretence. The CPS will also apply for the money and items already seized to be permanently stripped from Msokeri and donated back to charity. Msokeri will be sentenced on 6 April. Email “Woman who pretended to be widow of Grenfell Tower victim convicted of fraud ”. Feedback on “Woman who pretended to be widow of Grenfell Tower victim convicted of fraud ”.